Thank you very much for your interest in the Stony Brook Clinical Psychology Ph.D. program, and in potentially joining the SCTL. For more information on the overall program, including training model, and admissions information, please click here. FYI, at this point I do expect to review applications of Clinical Psychology Ph.D. applicants who express interest in my lab for entry in the 2019 - 2020 academic year. Information about the Stony Brook Clinical Psychology Ph.D. program can be found here, and a description of the graduate program in psychology at Stony Brook can be found here. As many potential applicants have similar questions, I have listed the most common ones below. 1. Is it confirmed that you are accepting students for the 2019-2020 academic year? Due to the way graduate student slots are allocated, I cannot say with 100% certainty that a Ph.D. student position in my lab will be available. However, at this point I do expect to review application of prospective students. 2. What about for the 2020-2021 academic year? It is definitely still too early to say. Please check this page beginning around Summer 2019 for updates on whether I plan to review applications for admission in 2020. 3. What are the current projects in your lab in which graduate students can become involved? Please see this website under “Projects.” Graduate students are involved in all of the projects listed in this section. 4. What future studies will you be doing in this lab? Future studies will continue to look at processes underlying social competence and social difficulties in children and adolescents with and without ASD (and, to a lesser extent, ADHD). We will also continue to explore and examine different interventions meant to tap into and affect these processes, as well as diverse mechanisms of change within these interventions. Finally, I hope we will be able to consider such interventions in the context of both efficacy (i.e. lab-based, well-controlled) and effectiveness (i.e. community-based, ecologically-valid) trials. 5. Can you give me more details about your research studies? For both lines of work, please read the articles that are bolded in the Publications section of this website. However, if you receive an interview, either on the phone or in person, that would be an ideal time to learn more. If you have specific questions that would determine whether or not you want to apply, then feel free to write me an email at matthew.lerner@stonybrook.edu. 6. Do you interview candidates? When I am accepting applications, I will interview a short list of finalists over the phone, and then a smaller number will be invited to in-person interviews. This process will likely occur in January through February (though sometimes takes place as early as late December). 7. What are you looking for in a prospective graduate student? As this is a clinical scientist (i.e. usually research-focused) program, the top criterion is research match. Competitive students will likely have worked on some (preferably) independent research project(s) such as an honors thesis, a conference poster, or published paper, about an issue related to what we study in the SCTL (ideally this will be related to what they propose to study in graduate school, though I can imagine situations in which this is not necessarily the case). However, as our work involves ample clinical contact with--and thereby necessitates sensitivity to--children and families, some experience working with the population on which you hope to focus is a plus. As such, I do tend to value in applicants their "real-world" experience, which may be used to inform research goals. Overall, it is helpful to demonstrate in your personal statement (1) some working knowledge of both the research literature in the relevant field of study and a good understanding of the studies that have been conducted in the SCTL; (2) past research (and perhaps some clinical) experience in that area; and (3) what projects you want to do in graduate school to build on this literature and contribute to the SCTL. Of course, not all (competitive) applicants have done this, but this is good general advice. 8. I want to do research in graduate school that is about autism spectrum disorders (ASD). Would this be a good fit at this time? In general, this is an area on which the lab had a particularly strong focus, and on which we intend to continue to work for the foreseeable future. 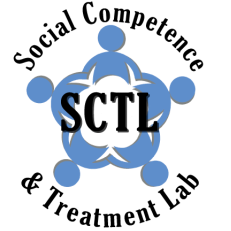 In particular, the SCTL tends to focus on school-age and teenage youth with ASD, with an eye towards understanding features of social functioning and intervention (rather than on diagnosis, per se). As such, if these are age ranges and topics that you'd like to research in ASD populations, you might want to consider applying to the SCTL. 9. I want to do research in graduate school that is about ADHD. Would this be a good fit at this time? While this is an area on which we have previously focused, there are not active studies aimed towards ADHD populations in the SCTL at this time. That said, I am open to students' interests, and if a student with a focus on ADHD presents an especially good fit for the lab, this could be a direction in which we head. 10. I want to do research in graduate school that is about friendships and social competency in typically-developing children or a clinical population not listed here. Would this be a good fit? Active studies in the SCTL include groups of typically-developing and possibly other child clinical populations. So long as your topic focus is a close match with the lab goals, there many be opportunities to develop a focus on these populations in graduate school at the SCTL. 11. I want to do research in graduate school that is about [something else entirely]. Would this be a good fit? This is trickier. I cannot give a clear answer without seeing your whole application, but in general, applicants are most competitive when they convey a strong fit with the current or upcoming projects planned in the lab. As such, I would again recommend you carefully review the work that's been done in the SCTL so far to ensure a close match with your research goals. Thank you for your interest in the one year Master's in Psychology program at Stony Brook. For more information on the program, please click here. Those applying to the Master's program who are considering indicating interest in joining the SCTL should you be accepted, should first verify that your specific research focus aligns well with current and upcoming projects in the lab, which you can learn about here. To determine if your research interests are a good match, an overview of the SCTL's research program is available here, and you are also encouraged to reference select publications. Master's students who are a good fit for the SCTL have some working knowledge of both the research literature in the relevant field of study and a good understanding of the studies that have been conducted in the SCTL. Students should have past research (and perhaps some clinical) experience in that area. I do tend to value "real-world" experience as well, which may be used to inform research goals. You will have an opportunity to discuss a potential fit here following acceptance to the Master's program. *While not mandatory, prior research experience is a key consideration for admission into the program. An honors thesis, while not as difficult or grueling as a graduate thesis, is a large time commitment that goes above and beyond a commitment to weekly lab hours. Being flexible and persistent in balancing your time is key. Considering your topic early and choosing something you are passionate about is essential to ensuring that your thesis project will be a valuable and enjoyable experience. Prospective honors students who are considering completing an honors thesis in the SCTL should plan ahead. Prior research experience in the SCTL is very important for consideration. Thus, you are strongly encouraged to spend at least 2 semesters as an undergraduate research assistant in the SCTL beforehand. This will provide valuable insight as you will be more familiar with the resources and data available to you here, as well as the style of mentorship offered. Students seeking to join the SCTL now as you consider the role of research over your undergraduate career should please read below for information for Prospective Undergraduate Research Assistants. Prospective undergraduate research assistants should have a specific research focus that aligns well with current and upcoming projects in the SCTL, which you can learn about here. To determine if your research interests are a good match, an overview of the SCTL's research program is available here, and you are also encouraged to reference select publications. Qualities and qualifications valued in research assistants include, but are certainly not limited to: willingness and eagerness to learn; proactive work ethic; ability to work well independently and as part of team; time management; open and professional communication; enthusiasm to be involved in projects that interest you; academic excellence (GPA 3.5 or higher); prior RA experience, especially (though not necessarily) with children and/or clinical populations is highly recommended; must have strong interpersonal skills and be comfortable interacting with children and families. RA applicants will preferably commit to 9 hours per week (3 credits); if needed, a commitment of 6 hours per week (2 credits) may be considered. At least a one-year commitment is very strongly preferred. 1. What if I do not have prior research experience? Experience in research before joining the SCTL can be extremely valuable. However, I also consider other experience that prospective students have that is relevant to your research interest and/or includes hands-on experience with the population you are interested in. Research assistants with and without prior research experience both have plentiful opportunities to learn. 2. What if I am not a Psychology major? It is not essential that prospective undergraduate research assistants major in Psychology. That said, experience related to the area of Psychology you are interested in, and that overlaps with the SCTL's research, can compensate for that. Additionally, some Psychology coursework and demonstrated knowledge of the field is necessary. If the SCTL's research seems like a good fit, please send an email inquiry to lernerlab@stonybrook.edu about applying to be a research assistant, including some information about your research interests. High school students who are interested in volunteering in the SCTL should have research interests that align well with current and upcoming projects in the SCTL, which you can learn about here. Prospective students can further determine if your research interests are a good match, by reading an overview of the SCTL's research program here; you are also encouraged to reference select publications. If the SCTL's research seems like a good fit, please send an email inquiry to lernerlab@stonybrook.edu about opportunities to volunteer, including some information about your research interests.